For weeks now, I’ve been reminding myself to go see the Home Sweet Home exhibition at the Iparművészeti Múzeum (Museum of Applied Arts), which, incidentally, is the third oldest applied arts museum in the world (or one of the oldest at least, depending on what you read). It runs until November 15 and time was running out. So late this afternoon, I went. And was dutifully impressed. I was with three American friends, all of whom qualified for a concessionary ticket. Am not sure I agree with stuff costing more to be young(er). But hey – at less than €10 for a full-priced combination ticket that gets you into everything, it’s nothing to be sneezed at. The Home Sweet Home exhibition is actually three exhibitions in one. Tickets also include admission to the BID – Collective Imagination (Imaginación Collectiva) and the Hungarian Design Awards and Design Management Awards exhibitions. I was particularly impressed with a range of clothing designed for those with autism, based on studies of behavioural habits and favourite poses/relaxed positions. There was also a set of black-and-white ceramic tableware designed for those who are partially sighted; shopping bags made from fishing line and wire; and shoes that can be worn on either foot and so are only sold in ones. I love design shops. I love seeing how creative people can take thoughts and turn them into something tangible. I love the possibility of it all. Globalization, technological revolution, environmental issues, sharing economy – concepts that have shaped our mindset in recent years. But how does an abstract concept take form? How does the world leak into our homes, how does our micro-environment transform into a mirror of the society, and how are designers inspired by the big changes of history? HOME SWEET HOME exhibition tries to answer these questions – mainly through items by Hungarian designers, in an inspiring way for both general public and professionals. The second exhibition runs a little longer. Lifting the Curtain presents the birth of modern architecture in Central Europe from a rather different perspective. [PF and CM – thought of you both – you’d have loved it.] It’s not about architects or styles, but more about the networks of modern architecture and the influences that transcend borders. I hadn’t known, for instance, that back in 1944, as the Russians were getting closer and closer to Budapest, an entire class from the Technical University (including students, professors, and admin staff – some 1600 in all) were put on trains and shipped out of the country. The idea was to save a generation of engineers and architects who would return to rebuild the country once the war was over. Most ended up in Denmark as POWs before eventually returning to Budapest where the architects among them brought back some influences of Danish modernism. Who’d have thunk it? Stolen wallet aside, it’s been a good week, one that ended in fond reminiscences. It’s not often I get to sit people who don’t know each other around a table and listen to them discover (and marvel at) how they all have Alaska in common. Or get to visit a home on Csepel Island that might have been transplanted from Valdez. Or actually get to do something before the window of time snaps shut on me. Yep – lots to be grateful for. And Rex, you’re here with us in spirit – we know. From a three-piece suit in a business blue to a shiny silver Vegas number accented with red socks, the boys from Pink Martini had a wardrobe to be proud of. A most unlikely looking bunch of musicians as ever I saw – not that anyone can ever really look like a musician except they have that rock-star chic look going. Ten lads of varying ages and nationalities took the stage in Budapest earlier this week with lead singer China Forbes. The band hails from Portland, Oregon, but they came from far and wide to get there. 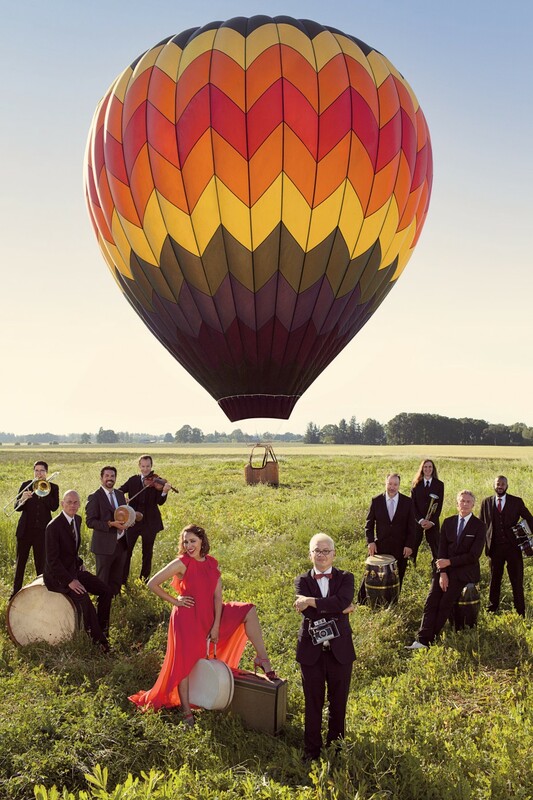 On the road since 1997, Pink Martini is a versatile little orchestra. 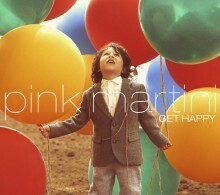 Their 2013 album Get Happy features 16 songs in 9 languages. No shortage of variety there. Band leader and founder of the whole shebang, Thomas Lauderdale, spoke to the mainly Hungarian audience in Budapest this week – in Hungarian. Granted, his pronunciation made mine look pitch perfect, but he tried. And not just the usual ‘Hello, Budapest’ either. He had pages of script and introduced many of the numbers in halting Magyar. One of the first classics they played was Je ne veux pas travailler (I don’t want to work) which is now an anthem of sorts for any sort of strike in France): I don’t want to work, I don’t want to lunch, I only want to forget and so I smoke [English translation; song is in French]. 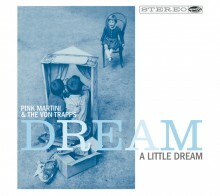 Their 2014 album Dream a Little Dream has some interesting guests: Sofia, Melanie, Amanda and August von Trapp, the great-grandchildren of Captain and Maria von Trapp of The Sound of Music fame. How did I not know that (a) the von Trapps were a real family and (b) they still sing together? Where have I been? It takes listeners from from Sweden to Rwanda to China to Bavaria, and also features The Chieftains, who have to be among Ireland’s best known exports. I first met them a few years ago when my mate VB from Arizona sent me their album Hang on Little Tomato. I fell in love with the song Let’s never stop falling in love. She also sent me Hey Eugene with its classic of the same name, written about a chap China met out on the town one night, a chap called Eugene who took her number and never called : Hey Eugene! Do you remember me? Percussionist Martin Zarzar (from Peru) works Mar Desconocido, a number which Lauderdale describes as ‘like a song from a Pedro Almodovar film with an excerpt of a Chopin waltz in the middle of it.’ That might go some way in describing just what the band are about. They’re bloody amazing. One of the most memorable numbers of the night had to be a duet of an old Armenian number featuring percussionist Timothy Nishimoto (him of the red socks). I lost count of the number of languages on stage – I know there was French, and English, and Armenian, and Croatian, and Spanish … and possibly more. But then again, what would you expect from Harvard graduates? Hungarian audiences aren’t noted for going wild. Theirs is a more restrained enthusiasm. And yet, when Lauderdale invited the audience on stage a couple of times to dance to particularly dancy numbers, there was no shortage of volunteers. By the time I weighed up the hassle it would be to extricate myself from my centre section seat and the energy it would take to actually move in something fashioning a dance, against being able to say that I was on stage once with Pink Martini, I stayed put. Make no mistake: I’m a fan. And I’m glad that the lovely VZsZs managed to get some tickets. But I was knackered. So tired, in fact, that I almost fell asleep. Not good. I’ve been to concerts (Kris Kristofferson and Leonard Cohen come immediately to mind) that have gone on for more than a couple of hours. But lately it seems that gigs are getting shorter. Sinéad O’Connor wasn’t on stage for much more than an hour. And Pink Martini didn’t last much longer. What it is I wonder? Is it because our attention spans are shortening? It can’t be money, can it? It’s the same to them whether they play for one hour or two surely? They’re in country anyway. Mind you, there was some debate on stage over whether or not they’d been to Budapest before. Turns out they had been – but only to eat. They actually played at the Balaton. No matter. I got to seem them live. In Budapest. And for that I’m grateful. If they come your way, do what you need to do to get tickets. You won’t be disappointed. For anyone moving to a new city, making friends can be difficult. And the older you get, the harder it seems. I’ve reinvented myself a number of times, moving to cities and countries in which I knew one, maybe two people, and oftentimes no one at all. Back in my 20s it was easy. Most of those I met were of similar age and as young, free, and single as I was. They were open to meeting new people and making new friends. Of course, I’m blessed to be Irish, probably the one nationality in the world that almost everyone seems predisposed to liking. By virtue of my birth I come packaged with an expectation in others that I’ll be up for a party – whenever, wherever. In my 30s, I noticed a difference. A subtle difference, mind you, but an important one nonetheless. My peer group were now newly married couples, perhaps young parents whose priorities in life had changed. They had husbands and wives to go home to. They had children to bathe. They had stuff to do at the weekend and families to be with on the holidays. I managed. I always do. But it was a tad harder. In my 40s, it took a lot more effort. Moving to a country whose spoken language still defeats me, a country where things are simply different – not better or worse than other places I’ve lived, just different – this was harder again. And a lot of it was down to me. I had my peculiarities. I was prone to my particular figaries. And I had become a little more discerning about whose company I kept. I’ve noticed that my tolerance levels are gradually declining as the years advance. 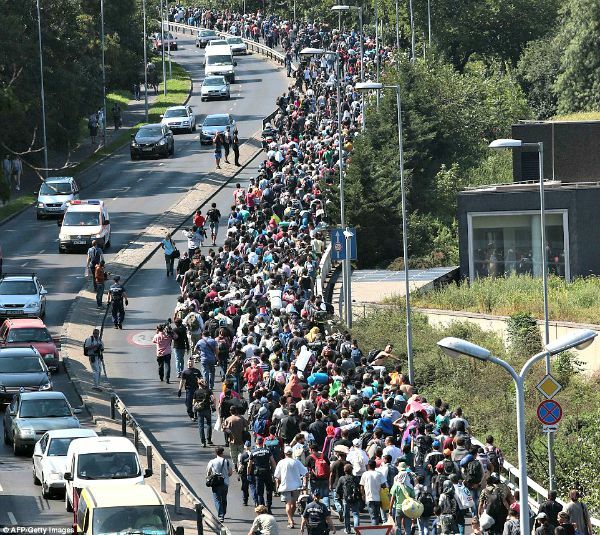 For the first couple of years in Hungary, I didn’t seek out an expat community. In fact, it wasn’t until the birth of the Gift of the Gab some two years after I’d arrived, that I had my coming out. I began to meet people. 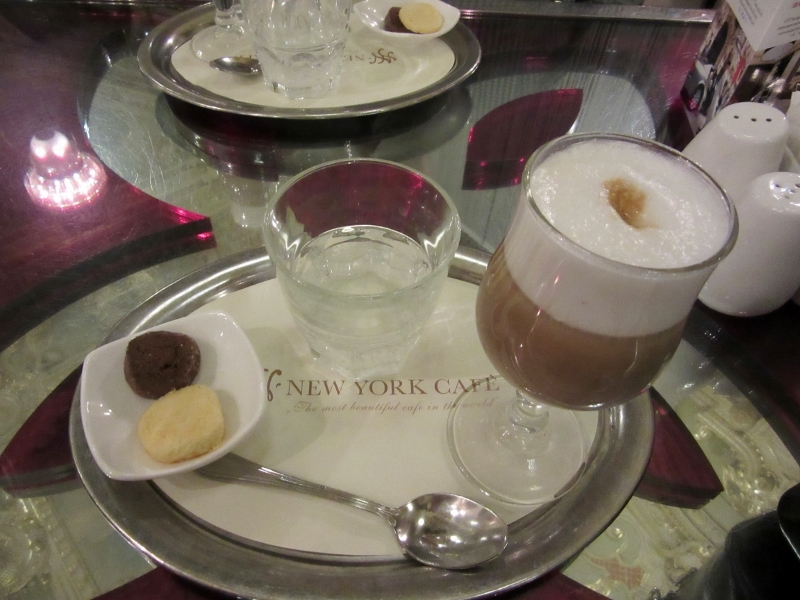 Some expat groups were a little too cliquish for my taste, a little too ‘them and us’ when it came to Hungarians. And I tried a few. And then true to form, the Irishness in Hungary won out. The Irish Hungarian Business Circle (IHBC) is one of a number of chambers in town and despite its name, its focus is not purely business; there’s a charity and a social arm as well. And the social arm is very inclusive. The regular pub gatherings (this year in the Caledonia) on the First Friday of each month draw people from all over. The volunteer work trips to the orphanage in Göd attract people of all ages. And the regular hikes during the year are one of the best opportunities this city offers to meet new people. Some hikes have had six hikers. Some have had over 40. The inimitable Malcolm Trussler tailors the walks to suit the numbers … and the weather. Last Sunday saw 20 of us get the train to Nagymáros where we caught the ferry across to Visegrád and from there hiked a nice 10.5 km through the lower Pilis hills to Pilisszentlászló. 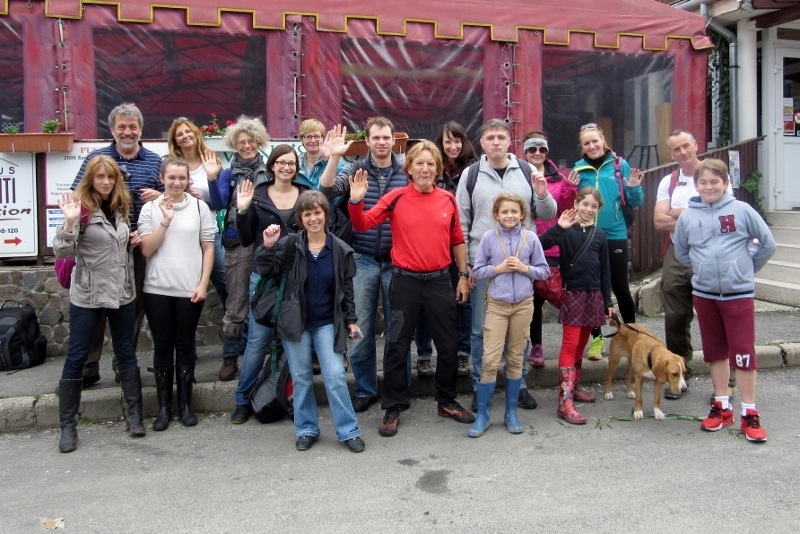 Sixteen adults, four kids, seven nationalities … and a dog. As we wended our way through the hills we fell in with different people and had a chance to chat without distraction. No phones. No iPods. No tablets. Just us. Clean air. Good conversation. Afterwards, we ate at the Kis Rigó Vendéglő before bussing back to Szentendre and catching the Hév back to Budapest. Next hike is planned for October. Dust off those boots and get the thermos ready.